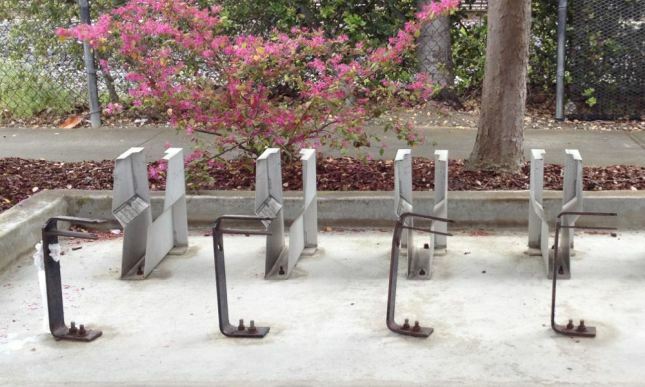 Go read her posts about these poor excuses for bike parking devices. Note: none of these work at all with my recumbent bike. Here is a wheel-bender that I photographed at MIT a few years ago. The main characteristic of a wheel bender is that it holds the bottom of the wheel without supporting the frame. 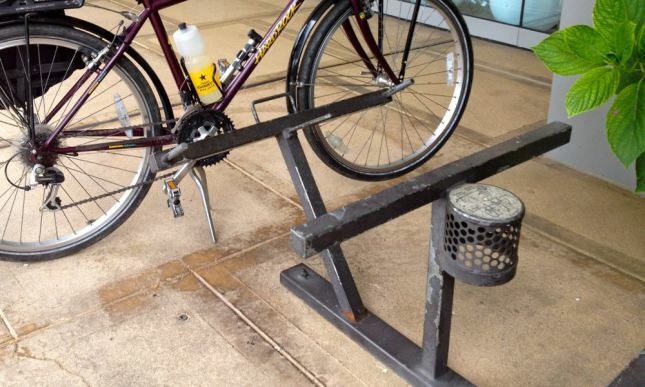 This maximizes the leverage for bending the wheel if the bike is knocked over. I see variants of these bike-damaging excuses for bike parking all over the place, but have not taken many pictures of them. 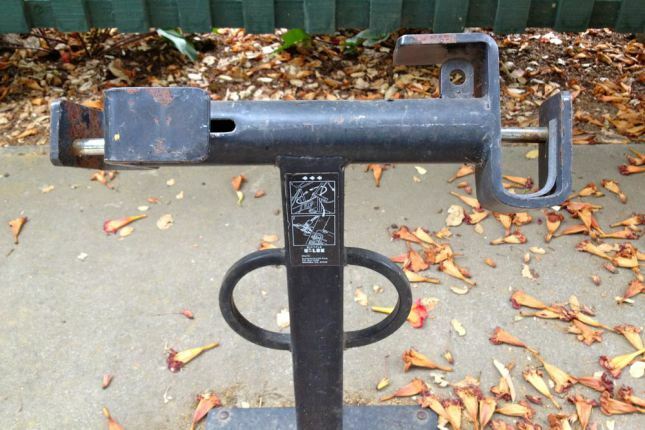 The wheel benders are very cheap, can be squeezed into very little space, are visually unobtrusive, and are universally hated by bicyclists—those features make them popular with places that are required to put in bike parking but really want to discourage bicyclists—the nearest MacDonald’s has wheel-benders, for example. I do not patronize businesses that use them (unless forced to do so, and then I try to talk to the manager about their anti-bike design). If readers of my blog are interested in seeing some of the bike parking pictures I’ve taken, let me know, and I’ll try to do posts of some of the more interesting ones. 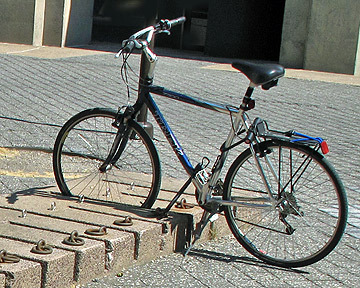 Mostly I’ve taken pictures of good (or at least adequate) bike parking, but I do have some photos of common design or installation errors. I’ve just been reading So Long, And No Thanks for the Externalities: The Rational Rejection of Security Advice by Users written by Cormac Herley in 2009. It gracefully captures why the security advice propagated by IT folks everywhere is almost universally rejected and resented by users. Cormac Herley thesis is a simple one—that users are acting in their own best interest by ignoring most security advice. The cost and impact for most end users to a security problem are fairly small and fairly rare, so that the on-going cost of remembering and following security advice is large in comparison. I know that I have always hated the web sites that make me change passwords every couple of months and use five different character sets in each password. The result of needing so many passwords has meant that I can’t remember them, and so I’ve had to record all my passwords in a file, producing a security hole much larger than the one they were attempting to patch by requiring super-strong passwords that change frequently. Some of the statements seem quaint: “Florêncio and Herley estimate that users have an average of 25 password accounts to manage”—I probably have hundreds of accounts, since every web site seems to want a password these days, even though the accounts exist only for the web site to track users (usually to the user’s detriment, so imposing password costs on them is doubly damaging). This doesn’t mean that large corporations should ignore security—particularly if they are responsible for handling many customers’ credit cards. The consequences of a security breach can be quite large for the company, not only in direct costs but in reputation damage and lost of customers to competitors seen as less careless. The solution, however, is not to require all customers and employees to have super-secure passwords, but to restrict access to the credit card information so that a stolen laptop does not unlock hundreds of thousands of accounts. First, we need better understanding of the actual harms endured by users. There has been insufficient attention to the fact that it is mainly time, and not money, that users risk losing when attacked. It is also time that security advice asks of them. A main finding of this paper is that we need an estimate of the victimization rate for any exploit when designing appropriate security advice. Without this we end up doing worst-case risk analysis, and this can lull us into thinking that we are offering orders of magnitude more benefit than is actually the case. Of course, the same analysis applies to a lot of the mandates for “training” everyone at the university about FERPA, about lab safety, about fire safety, about earthquakes, about sexual harassment policies, about health services, about signs of depression, about parking regulations, about smoking, about using the online purchasing system, … . Each individual training may have benefits but the cumulative cost is huge. I know I was forced to sit through a training session on the online purchasing system a few years ago, but I have never used the system since—I spent all my grant money on student salaries, which didn’t go through purchasing. The system has since changed, so I wouldn’t be able to use the training even if I remembered it (and had any grant money to spend). Allowing people who did a lot of purchasing to have direct access to the system rather than having to go through purchasing personnel was a good idea, but requiring that everyone (even those who made less than one purchase a year) to take the training was a total waste of effort. Parents, how would you feel if you were preparing for the biggest sales presentation of your career and instead of supporting you with reassuring encouragement, advice and confidence, your boss became progressively more stressed and emotionally unglued? You’d feel more pressure and less confident. And you’d probably resent your boss. If you’re the parent of a student applying to college, don’t be like the anxious boss. I completely understand why parents feel stress and anxiety during the college admissions process. Nobody is more invested in your student’s success and happiness than you are. But the most important job for parents of college applicants is to be just that—the parent of a college applicant. The stress of college admissions isn’t happening to you; it’s happening to your kid. Be calm and maintain your perspective. Offer support, guidance and encouragement. Cheer from the sidelines and remind them that you’ll love them no matter what Northwestern or Brown or University of North Carolina decides about their application. You’re in an important leadership role now. And leaders need to hold it together. I have been getting a bit stressed about my son’s application to colleges. As a home-schooling parent, it is my job to put together his transcript, his counselor’s letter, and the school profile. The transcript is still missing some course descriptions (for the courses my wife did with him—I’ve not been able to get 1-paragraph descriptions from either my son or my wife all summer! ), but I have complete drafts of the other documents. I would estimate that I’ve spent about 20 hours preparing these documents, maybe more. We’ll be doing 4 more college visits starting Sept 6: CMU, Brown, MIT, and Olin College of Engineering. CMU and MIT are obvious top-rated computer-science schools, Brown has a pretty good CS department and the lack of make-work distribution requirements is very appealing, and Olin has a project-based approach that is appealing. Last year, the lack of a pure CS major at Olin made it a bit less appealing to him, but over the summer he’s found that embedded systems and computer engineering can be fun, so Olin moved up in his internal ranking. From what we can tell on the web, CMU may not be a good fit, despite having top-notch CS and theater departments—the problem is that it seems that (like UCLA) non-majors get shut out of most acting opportunities. We’ll check on this more carefully when we visit. Acting looks quite feasible at Brown and at MIT, and Olin allows students to register for courses at Wellesley (2 miles away), which has 4 acting courses (though whether Olin students can fit them into their schedules is not clear). I don’t know whether we’ll have time to visit Wellesley on this trip—we haven’t scheduled it, but if the MIT shadow day falls through, we might have an extra day. Computer science programs at top schools offer tremendous breadth and depth – a wide range of course options with the ability to study at the professional level. And while cutting-edge tech attracts many students, the chance to earn top dollar upon graduation may be a higher priority, especially with tuition and fees on the rise. But which computer science programs have a track record of producing high-earning graduates? Check out our list below to see which programs truly stand out. I was interested to see that six of the top twenty colleges listed were University of California campuses and 9 of the top 20 were in California (probably because Silicon Valley provides high salaries and a fairly high probability of a windfall from a successful startup). Some people might be surprised at how high UCSC is on the list, but we have a pretty good CS department, and we’re really close to Silicon Valley. Of course, this list does not correspond particularly well with lists that track what undergrad colleges are best at producing students who go on to get CS PhDs or NSF Fellowships. A PhD is not good for maximizing financial return. Some colleges appear on both lists (MIT, UCB, CMU, Stanford, UW, UCSD). We have visited or will visit 4 of those—we’ve not been able to schedule a trip to San Diego or Seattle yet.